Mega Sale! 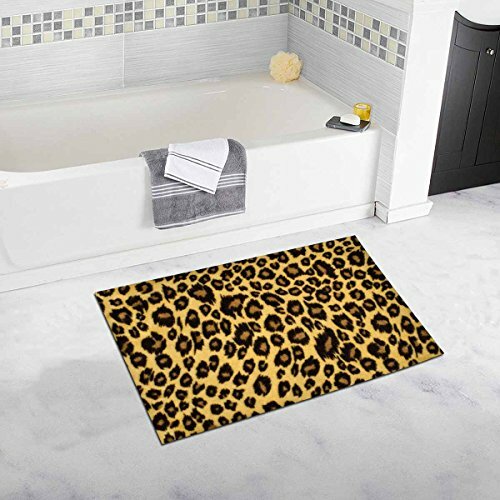 Save 27% on the InterestPrint Brown Leopard Fur Pattern, Spotted Animal Print Bath Mat Soft Bathroom Rugs Non-slip Rubber 20 W X 32 L Inches by InterestPrint at Animal Backgrounds. Hurry! Limited time offer. Offer valid only while supplies last. InterestPrint bedroom living room bath mat makeover your bathroom with just a single touch! Start with these fun and decorative bathroom mats. InterestPrint bedroom living room bath mat makeover your bathroom with just a single touch! Start with these fun and decorative bathroom mats. Measurements: 32 inches long X 20 inches wide. This mat has a soft plush surface and anti slip backing which is durable and long lasting. These unique designs match well with various color palettes of towels, rugs, shower curtains and any other bathroom accessories. It's a quick and luxurious way to refresh and completely change the appearance of a bathroom without a big expense. Designed for bathrooms and floor use.